This past weekend we drove around Lake Ontario (through a Gardiner Expressway closure, no less) to visit Matt & Kaylea — they of the recent epic wedding — to visit some wineries, have some laughs, and eat some of Matt’s cooking. We arrived earlier than planned but later than hoped, checked out their sweet new place, and zipped into Beamsville for some wine tasting. We attempted a Malivoire visit but the parking lot was so busy we didn’t even stop…we just 180’d in their driveway and left, then 180’d again when we realized we were heading away from stop #2: Tawse. Eventually we got there, bypassing the busy tasting room for the member’s cellar. We tasted through what would become a common occurrence: a cloud of fruit flies. Guess it’s that time of year. Anyway, we got to try several things we, and more importantly M&K, hadn’t tried before. We ended up taking away a case of six special one-off Chardonnays, around which we’re likely going to construct a big tasting or dinner party. Our wine club membership came in handy, as the power went out just as we attempted to make our purchases and the POS system wouldn’t reboot. “Bill me,” I shouted as I strolled out, “I’m a member!” OK, that didn’t happen, but we did get some cut-eye as we walked out past a dozen people waiting impatiently to pay. Before we knew it we were into the soup course, an unreal homemade butternut squash number, paired with a special treat indeed: a 2000 Thirty Bench Chardonnay. It had the same few suspect early sniffs as the 1999 Closson Chase Chardonnay we shared last year, but turned into creamy, rich goodness which got along so well with the soup they might as well have just eloped. That didn’t work, obviously. Finally I convinced him to drink some cream, and things righted themselves enough to move on to the main course: beef bourguignon. This we paired with another outstanding choice from their visit to Thirty Bench: a 2007 Cabernet Franc, perhaps my favourite red. We listened to a bizarre rotation of music, but finally settled on Of Monsters And Men long enough to get us through all the beef and mushrooms. Then came dessert, a beautiful roasted Italian plum ice cream with cinnamon and my dad’s maple syrup. A Fielding Rock Pile Pinot Gris purchased earlier in the day went nicely with dessert. Note that there are no decent pictures of either of these, as I annihilated them before I thought to snap a pic. None of us were terribly quick to jump out of bed the next morning, obviously, but neither were we poorly. Whatever shakiness we might have felt was quickly erased with some delicious Fahrenheit coffee and a stellar Matt breakfast of eggs, pork chop-sized hunks of peameal bacon, and English muffins. Good thing too: we had more tastings to do! Once we’d all showered and poured Nellie into the car we set off toward the bench. Malivoire was considerably less busy than it had looked the day before. After a misbegotten stop out front for cheese and some dodgy-looking white, we got into the reds inside. We left with a very good Pinot and a standout Cab Sauv and a mouthful of fruit flies. Next up was Megalomaniac, about which I’ve always been ambivalent, and so remain. Next was a completely new stop for all of us: Vieni. I’d never heard of it but Kaylea, being the plugged-in type that she is, guided us there. It’s a very large property, but very new, and a little scattershot with the wine lineup, but that should improve with age. Nellie picked up yet another bottle of sparkling, and I was happy to pick up an Aglianico, which they claim is the only one made in Canada. It’s certainly the only one I’d ever seen. I am, in fact, drinking it right now as I write this blog post. Our final stop of the weekend was Thirty Bench, where I’d hoped to fill a hole in our vertical collection of Cab Francs. Turns out they didn’t make the vintage we’re missing…so I suppose we’re not really missing it. We also picked up a Pinot without tasting it, it having been recommended to us to do so by miss Kaylea. We left there and, realizing it was late afternoon, decided to grab lunch at Syndicate, a nearby gastropub. Unfortunately we didn’t do the math on just how late it was until we’d already ordered — we didn’t have much time to return the car given that the Gardiner was still closed. The rest of the meal turned into a bit of a frenzy, after which we dropped Matt & Kaylea back at their house and sped away, making excellent time all the way around the lake to the west end of Toronto before getting jammed up. We took alternate routes and side streets and a few ill-fated turns and in the end got the car back only six minutes late, which was pretty damn good. 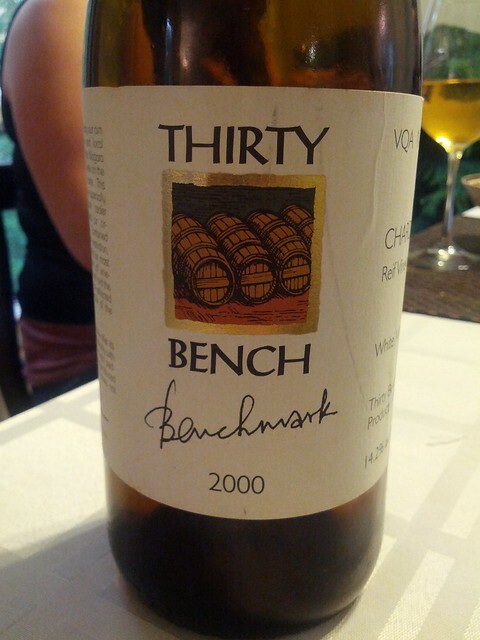 Rounding out the haul was a gift from Matt & Kaylea: a 2002 Thirty Bench Benchmark Red. Zoinks! We’ll build a meal around that soon. It was fun, but it may prove dangerous having these particular friends less than an hour (Gardiner hell permitting) from our home.